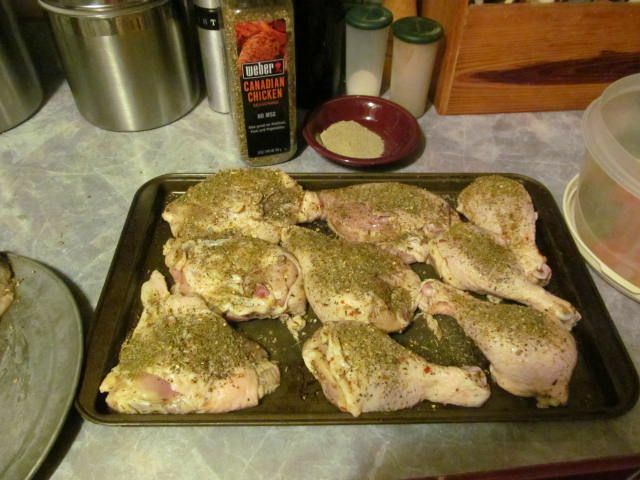 I marinaded breasts, thighs, and legs in Stubbs Chicken. I also injected about a half of a bottle of the Stubbs in the breast of a chicken. Everything got about 5 hours of happy time in the frig. 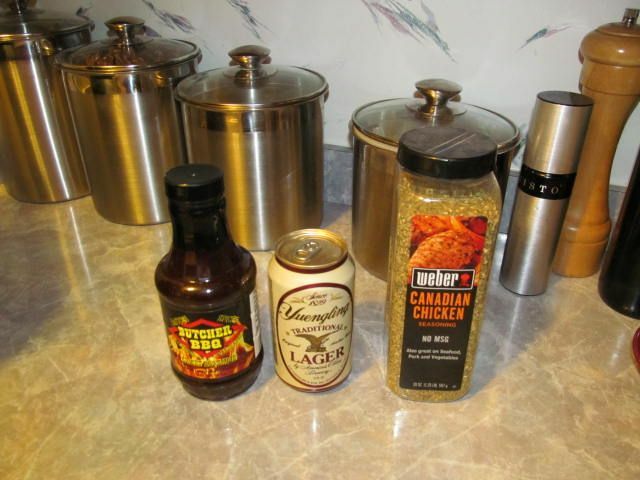 The beer can mix was 1/2 Yuengling, 1/4 bottle of Stubbs Chicken, 1 Tbsp of Montreal Chicken. 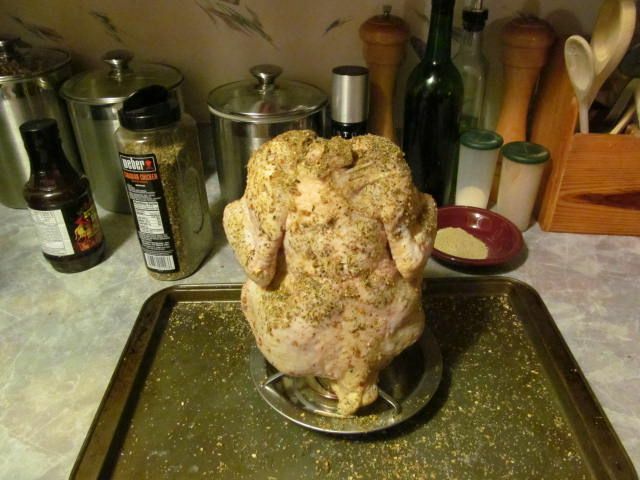 Placed the chicken on its throne and dusted outside with the same rub. Pieces got a nice dusting of the Montreal Chicken rub. I wanted to use peach and hickory rub, but I still had Stubbs Oak/Apple/Hickory in the chute from my bacon, so I went with that. 1 hour at 250. Glazed with Butchers BBQ/honey mix. 30 minutes while ramping the Baby up to 350. 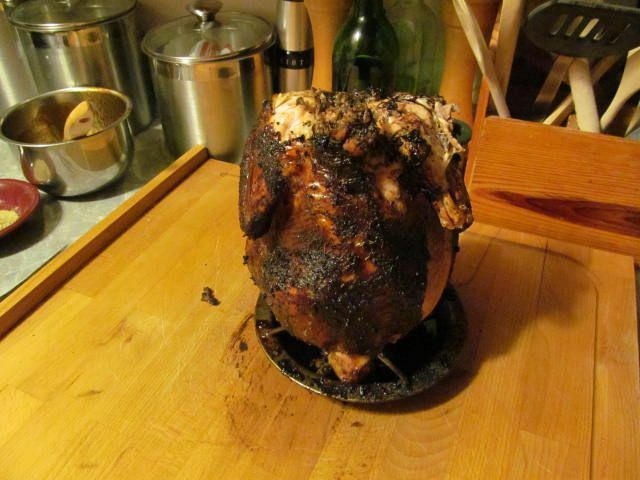 As you can see, the Montreal rub imparts a dark color to the chicken that might not sit well with judges. Flavor was great. But, I don't think it is better than using the Butchers Honey Rub. 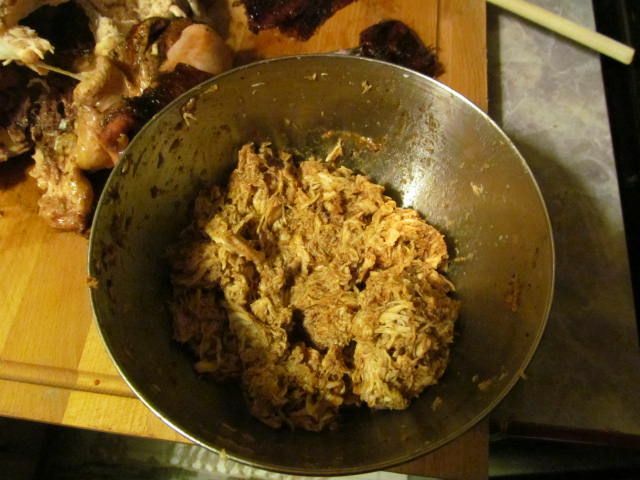 I used straight breast meat and pulled it like pork. 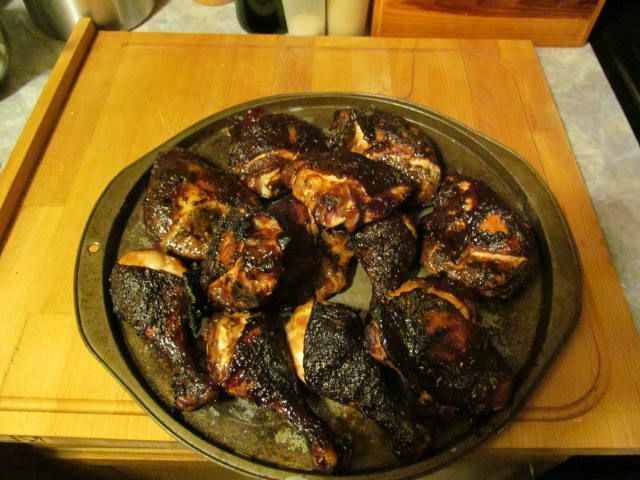 I put fine ground Montreal rub, 2 pinches, and about a quarter cup of sauce/honey mix on the chicken and mixed well. Nice, tender, juicy. Good stuff. I will mix some thigh meat in next time for some of the fat factor and will also try the honey rub. Also, the longer it sits, the better it gets. This would make a killer sandwich! Sounds great, Bill. Those chicken thighs that everyone makes for KCBS make me nervous. I like the idea of adding some pulled meat. What do the judges think of it? This stuff would make a great pizza or sandwich as well.